The LUX Hydroxyl System with our biodegradable chemicals are unique in their technology, working with standard commercial washing equipment to naturally super charge the water, detergents and other cleaning products prior to injection, providing optimal operational results. The best part of the new advanced chemistry is that it works in cooler temperatures to reduce energy consumption, providing a significant savings to the customer on day one, while still outperforming the market in terms of cleanliness. Earth friendly and completely biodegradable, the products perform as well or better than alternative products and are designed to save money, time and storage space, as well as environmental resources. 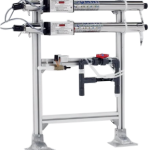 OMNI Solutions’ Smart Ultraviolet Light Advanced Oxidation System (SULAOS) has revolutionized the laundry disinfection process. SULAOS dissolves organic materials from water through an enhanced oxidation process for Tunnel Washers. Using a combination of methods involving Ultraviolet (UV) Light, the system produces potent oxidizers, including hydroxyl radicals which react with organic contaminants, destroying them in the treated water. SULAOS employs state-of-the-art water reuse technology to deliver significant water and energy savings. 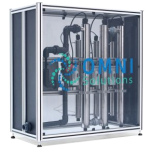 OMNI Solutions’ unique system potentially reduces dry times by optimizing textile temperatures before drying.